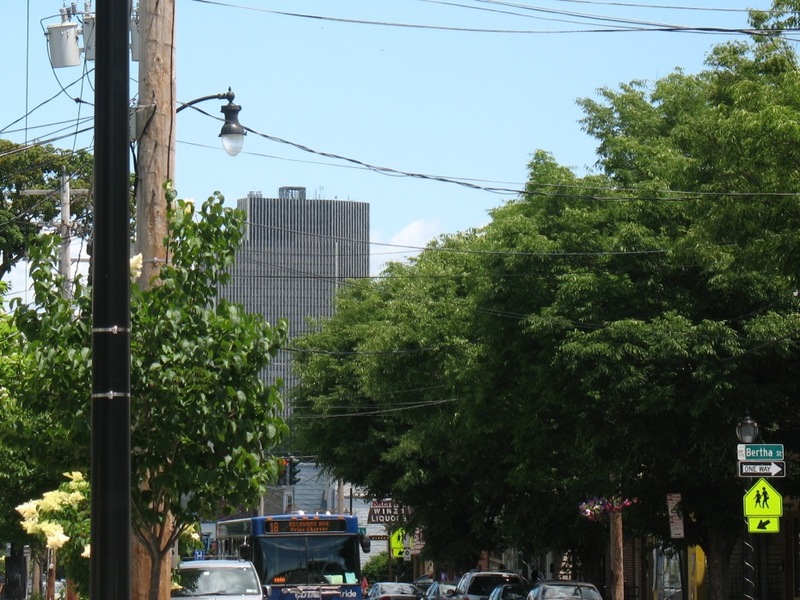 What is that structure atop the Corning Tower? 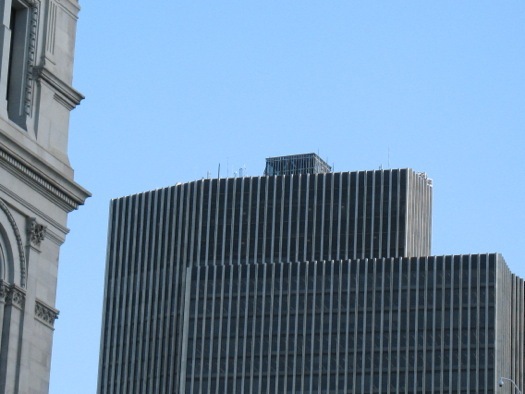 [W]hat the heck are they doing on the roof of the Corning Tower? AR was referring to the box-like structure that's been built atop the tower. It's noticeable from a bunch of different angles. The 25 foot high structure being built on top of the Corning Tower is an enclosure that will protect the equipment on the roof that we use to conduct building maintenance that includes repairs to the marble, window replacement, and washing. When it's finished the outside will be very similar in color to the building. Groll said via email the structure is a permanent addition. Here's a pic with a wider perspective, from Delaware Ave.
NYS OGS's At the Plaza series advertises on AOA. It's a shame that they'd ruin the roofline of the building with a storage shed. The building's architects must be rolling over in their graves. I thought, for sure, that it was the new Governor's office, from where he could look down on his estate and serfs. Sure. They're telling us it's just a shed to house building maintenance equipment. A mundane explanation obviously formulated to keep us quiet and satisfied. And to keep us from asking questions. You can choose to believe it, if it makes you feel better. -Gov. Cuomoâ€™s central command center for his re-election bid. Word on the street says it contains several drone missiles. -A multi-purpose, all-seeing "eye-in-the-sky" for the City of Albany. And you thought they were just talking about "red light cameras," now didn't you. -A penthouse bunker for use by Dean Skelos in November. No way is that guy going without a fight. its a nice distraction for people. This way, maybe be don't pay attention to the Albany Housing complex on Green Street and Rensselaer Street? Keep'em coming, boys and girls! I heard that they were using it to pilot drones from up there. It's why the observation deck was closed for so long, they were doing testing up there to see how it would work out. Makes sense seeing as it is the tallest point in the area (and gov't controlled). I just noticed the structure right before this article was posted and wondered where it came from...and why I hadn't noticed it before. I live close to the tower, but I'm so used to seeing it that I don't look up too often. I'm not a fan of the Plaza architecture (except for The Egg to some extent). But the tower at least had those clean, symmetrical lines...and this glorified tool shed ruins that.